1. 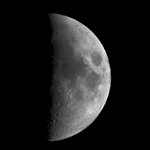 Why do Lunar Mosaics? Consider the Moon. Whether you're a visual observer or a deep sky imager it always seems to be in the way. It's always filling the night sky with its sun-reflected light pollution. But on those crystal clear nights when the Moon is "ruining" the show have you ever stopped to observe those photons? They really are putting on quite a show all by themselves! The Moon offers some truly spectacular views and its face changes every night. It is the beauty of the lunar landscape that lures many into capturing its natural aesthetics in high-resolution digital images. 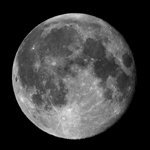 One problem with imaging the Moon is that it is so large, about 30 arc minutes in diameter. 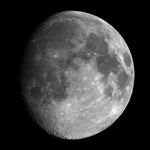 To capture all the detail the Moon has to offer requires imaging at a fairly long focal length - the longer the better. The limitation comes, of course, from the seeing conditions, that is to say how steady the atmosphere is at your location. The steadier the seeing, the longer the focal length you can get away with before your images start to look like a blurry mess. But with longer focal length comes the challenge of field of view. 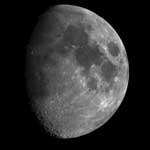 Depending on the chip size in your imaging device you will not likely be able to take a full phase image of a large object like the Moon in one frame unless you use smaller focal length optics. It would seem that image detail and field of view are trade offs. If you want a large field of view (at least 30 arc minutes) you must compromise on image detail, and if you desire image detail, you must compromise on field of view. 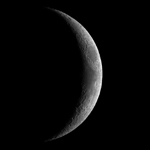 Actually there is a solution that allows you to maximize your focal length for the seeing conditions and capture the full content of the current lunar phase. The solution is to take many overlapping frames of different areas of the Moon and stitch them together into a single seamless image. This result of this process is called a mosaic. This article discusses a proven technique for constructing high-resolution lunar mosaics. Much of the work in developing this technique was done using a CCD camera and so the article is slanted with a CCD bias. Nevertheless, with a bit of thoughtful creativity and application, most, if not all, of the techniques presented here should be applicable to imaging with a webcam, digital camera, and/or film.